The landscape of Jodhpur is dotted with several enchanting forts worth a visit and Mehrangarh Fort is one of them. It was constructed by the fifteenth Rajput ruler Rao Jodha. The present form of the fort is the result of new additions made by the other successive rulers. The massive fort is perched on a hill. It is one of the largest forts of India. It is fortified with thick walls. The complex of the fort has several beautiful palaces with impressive carvings. It is a very large Palace which has five alcoves (a small recess opening off a larger room) opening into hidden balconies. It was built by Raja Sur Singh who ruled from 1595-1619. He built this Mahal for his five queens. It was built in typical Rajput style of architecture. The interior of this Mahal is studded with mirror work. It looks simply unbelievable. Several religious figures are also painted on some of the glasses. This brilliant Mahal was the creation of the imagination of Maharaja Abhaya Singh who ruled from 1724 to 1749. The lavish aura of this Mahal is a grand treat for the eyes. Here the Maharajas enjoyed the brilliant performances of dancing girls. The ceiling of the Mahal is adorned with gold filigree work. It was the home of Jodhpur's last ruler Maharaja Takhat Singh who ruled from 1843 to 1873. The architecture of this palace shows great harmony between the traditional and the modern styles. The Mehrangarh Fort also houses the most enchanting museum of Jodhpur. Here you can see several objects belonging to the royal past. Inside the boundary of the museum, there are several astonishing galleries such as Elephant's Howdahs (a wooden framed seat fixed on elephant's back) displaying several Elephant Howdahs decorated with silver and gold. The Palanquins gallery showcases beautiful palanquins once used as a means of transport on special occasions by the royal ladies. The Daulat Khana displays a rare collection of fine arts contributed by the Mughal rulers. Gallery is the best place to see the collection of armor of the rulers of Jodhpur. The Painting gallery is a paradise of the famous Marwar Paintings. And the Turban gallery displays various types of colorful turbans worn in each region during different periods of Rajasthan. 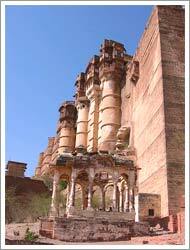 You can buy some handicrafts from the small shops located in the fabulous Mehrangarh Fort and take a souvenir with you.